You need to uninstall the test version of Ms Offi ce 2007. After a quarter of the uninstallation procedure, the system crashes. Since then, while trying to remove the package, only the error message appears that the language of the installation package is not supported by my system. What do you do? 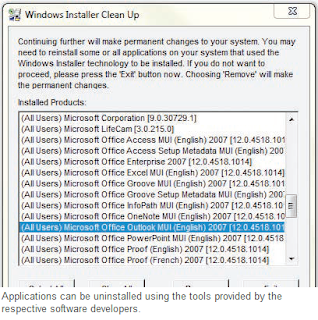 You will find an exact guide for complete removal and new installation of Ms Office 2007 on http://support.microsoft.com/kb/928218. The normal uninstallation routine – also when it completely goes through – does not possibly remove all traces from the system. That can lead to problems during a new installation. 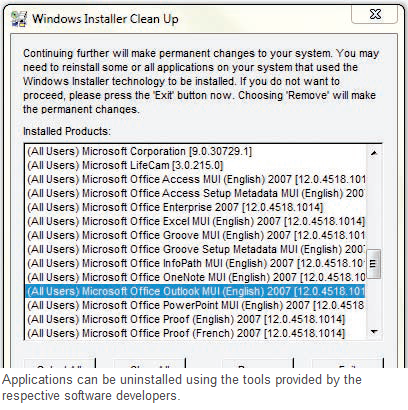 Even then, like in this case, a free Microsoft tool lends itself for the uninstallation. You can download it on the knowledge base website http://support.microsoft.com/kb/290301. It is important to close all Office programs before the start of the tool. You can positively do that with the task manager, which you can invoke with [Ctrl] + [Alt] + [Del]. After starting the tool select all the displayed Office components in the program window and click on ‘Remove’. A confirmation window follows, which you can confirm with ‘OK’.